Access: Paved County Road to Gravel County Road with Year-round County Maintenance, then Private Shared Gravel Driveway. 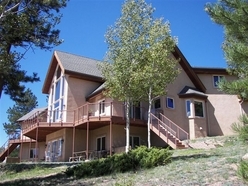 Twin Hawks Ranch Imagine a serene valley with velvety meadows carved out of fragrant pines, aspen-filled hillsides and a glistening pond as a centerpiece! 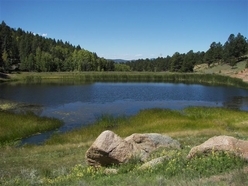 Twin Hawks Ranch is a place of reflection, inspiration and recreation accentuated by a beautiful Colorado setting. Its comfortable custom-built home with traditional décor offers a family-orientated floor plan with numerous high-end features and quality workmanship. The main level is designed with an open grand-room/dining area with wood-burning fireplace, gourmet kitchen, walk-in pantry, master suite with deck access, a guest bedroom, spacious office and generous laundry area. The loft and lower levels provide additional living/playing space. Everyone will appreciate the family sitting area w/ wet bar, woodstove, game room, 2 bedrooms and walkout to a lower patio. Extended stay family, friends or work associates will be thrilled with the guest house accommodations w/ 3 bedrooms, 2 baths and incredible views of snow-capped Pikes Peak and the Sangre de Cristo Mountain Ranges. Choose from a multitude of outdoor recreational activities. Take a leisurely hike on trails that meander through its groomed acres. Appreciate the quiet beauty, abundant wildlife and waterfowl that frequent the property. Try your hand at gardening in the fully operational year-round greenhouse or use the Morton Barn for hobbies, as a workshop or for animal pursuits. The gentle, rolling pastures with perimeter and cross fencing are perfect for horseback riding or raising livestock. The pond has water rights and is ready for casting a line, canoeing, floating or just relaxing by the water. The mixed landscape of pine, aspens, meadows and water are the perfect habitat for area elk and mule deer. 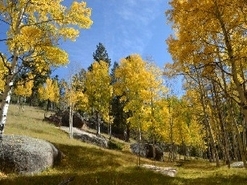 For even more Colorado outdoor recreation, public land like the Pike National Forest is just minutes away. Twin Hawks Ranch offers the quiet stillness of a Colorado mountain lifestyle that harmonizes with nature and inspires the imagination!